This popular pine tree is widely found throughout the world, but the Scots pine (often known incorrectly as Scotch pine) is the one claimed by Scotland as its national tree. 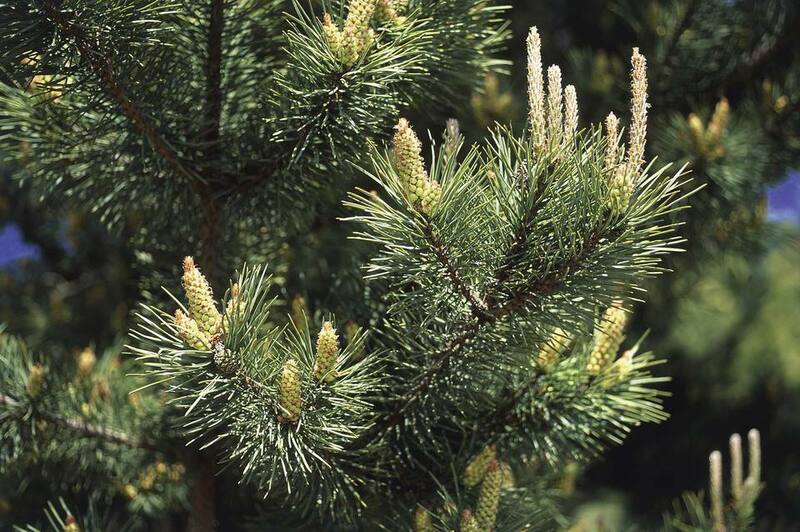 This long-needled pine is a famously popular specimen for Christmas trees, but its long life makes it a popular specimen for some landscape applications, as well. The Scotch pine is a long-needled coniferous evergreen that can easily grow 125 feet or more in height, with a trunk 3 feet or more in diameter. Most mature specimens reach about 60 feet in height, with a width of about 40 feet. The tree is pyramidal in shape when young, but becomes flatter on top as it ages. The Scotch pine is a long-lived tree with an expected life-span of 150 to 300 years; the oldest recorded specimen was in Lapland, Northern Finland, estimated at more than 760 years old. The central trunk of the Scotch pine is very long and straight, with scaly, flaking bark that is dark near the bottom, turning a rusty color toward the top. The needles are 1 to 4 inches long, depending on variety, shedding about every three years. The needles are bunched in pairs that twist together. As with other conifers, or cone-bearing trees, this tree has special reproductive parts called strobili, the Latin term for cones. The cones are pinkish red when young, maturing to gray-brown; they are 1 to 3 inches long and feature diamond-shaped scales. P. sylvestris var. sylvestris is found across most of the naturally occurring range, from Scotland and Spain to central Siberia. This is the tree, along with its cultivated varieties, that are normally planted in landscape applications, and is the one planted and harvested for the Christmas tree market. P. sylvestris var. hamata Steven is native to the Balkans, northern Turkey, Crimea, and the Caucasus. P. sylvestris var. mongolica occurs naturally in Mongolia and in parts of southern Siberia and northwestern China. The Scots pine is monoecious, which means that it bears both male and female reproductive parts. A Scotch pine does not need another Scots pine to reproduce; it can reproduce on its own. This large tree is sometimes planted as a specimen in large landscapes and public parks, but it is more often used to form windbreak or screens on farms or in large rural landscapes. It is not the best tree for ordinary residential landscapes due to its large size, but it is sometimes planted where soils are very difficult. It is also very commonly grown commercially for the Christmas tree market. Scots pine is not grown for its lumber. The Scots pine will tolerate almost any type of poor soil, which makes it valuable in land reclamation projects. Plant it in a location where it gets at least 6 hours of full sun each day, and make sure to give it plenty of space, as this is a tree that will get very large. Mulch the area around the base of the tree to a depth of 3 to 4 inches, and reapply mulch every 1 to 2 years. Once established, this tree requires little care. Scots pine has a good tolerance for clay soils and for drought. Water only during warm temperatures, and only if the tree has not received adequate rainfall moisture. Feeding is not mandatory, but if you do feed, do it once each year in the spring just before dormancy breaks, using a 15-5-10 slow-release fertilizer. Spread the fertilizer in a band just under the outer perimeter of the pine's canopy, raking it into the top layer of the soil. Water the tree thoroughly immediately after feeding. Pruning is usually not necessary unless you want to maintain the classic Christmas tree shape. To promote thicker growth, pinch off the new growth shoots ("candles") in the spring as they appear. Remove dead branches, and if rubbing branches are evident, prune one of the branches away. Waterer Scotch pine (PInus sylvestric 'Waterei') is a modest-sized cultivar, growing to 20 feet with a spread of 12 feet. It is a relatively slow-growing form and is more useful as an accent specimen than other, larger varieties. When a Scots pine develops yellowing needles along a single branch, this may be a sign of a pine wilt disease, called Cyclaneusma needle cast. Consult an expert for confirmation, and remove the entire tree if it is infected, as this fungal disease is incurable. Western gall rust and Lophodermium needle cast are also common in some areas. Porcupines and birds, especially pine grosbeak, may also cause damage to the tree.